Since I’m already halfway through my fashion week trip, I thought I’d go ahead and give you guys a little recap of the shows I’ve attended so far! 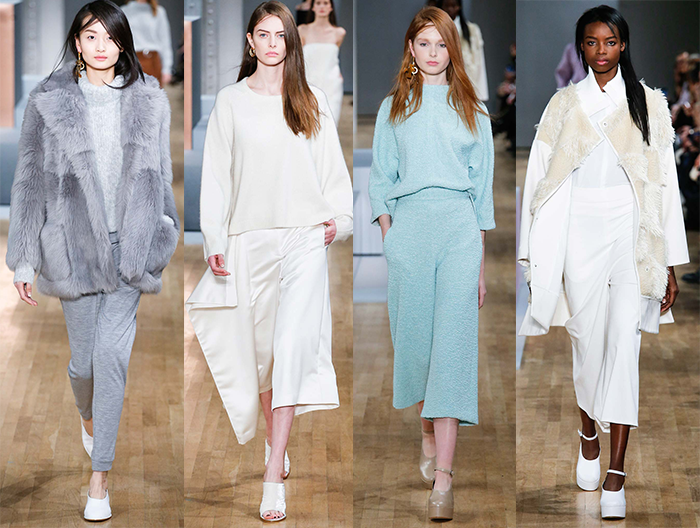 Out of the ones I’ve been to thus far, Tibi has been my favorite – and why wouldn’t it be? The collection encapsulates everything I want out of a look. Comfortable, neutral, effortless and timelessly chic. The best of all? Everything is so wearable! So many of the pieces that sauntered down the catwalk were items I would have thrown on that minute – but seriously. It’s really freakin’ cold here, and the cozy coats, cool culottes and plush, oversized sweaters are definitely at the top of my list when it’s this frigid outside! If you need more convincing, head over to Style.com to see the rest of the looks from Amy Smilovic’s Fall/Winter ’15 masterpiece. I do also want to note a few favorites from her current collection… I am dying over these raffia-adorned mules for when the weather warms up – aren’t they fab? I also may have just ordered this petal-embroidered peplum top… So cute! Nearly tying for first, Sally LaPointe is a very close second. It’s a new-to-me designer, but it certainly won’t be slipping past my radar here on out! If you’re looking for an overtly luxe look, you gotta see her pieces. I’m talking the most bountiful furs, flowy fringe skirts and the raddest oversized handbags that’ll have everyone talking. 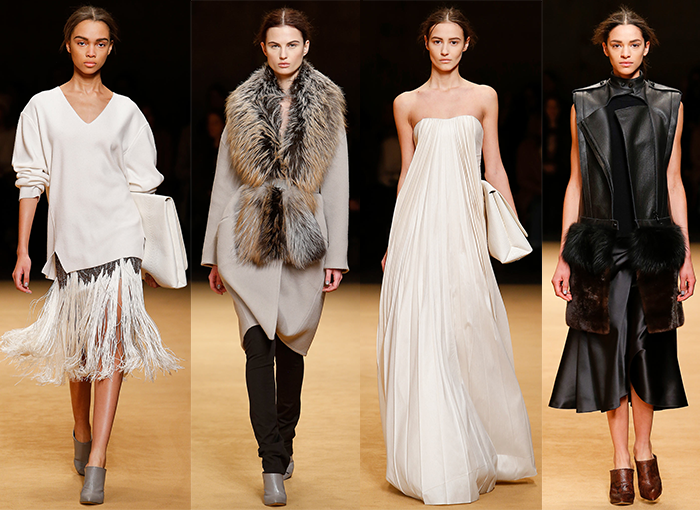 I’m totally on board with all the winter whites and creamy neutrals in this collection! Can’t wait to shop some of these pieces later this year… In the meantime, shop some items from her spring collection here! I really loved the whole 70’s theme happening over at Charlotte Ronson. 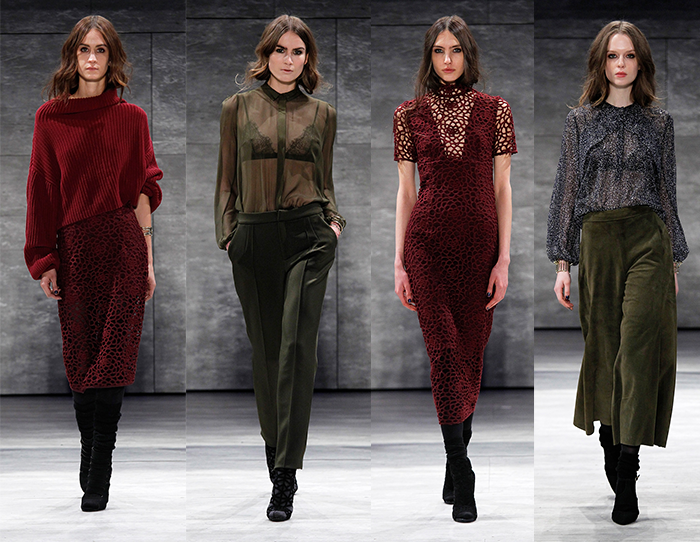 The sheer blouses, thick lace, and velvet bottoms really amped up the drama for fall. Deep oxbloods and dark olive greens were at the forefront, with romantic navy floral prints and pretty purple notes sprinkled throughout. Also, can we talk about the gorgeous beauty looks? The messy middle part. The black kohl eyeliner. So gorgeous! 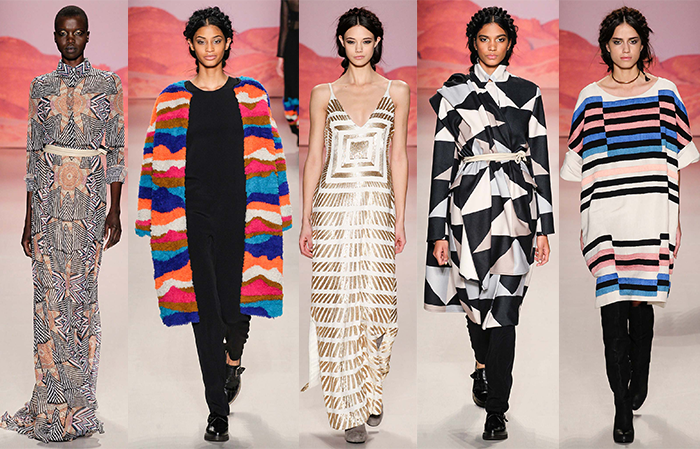 If you haven’t heard of Mara Hoffman, you should take today to crawl out of the rock you’ve been hiding under! I kid, I kid, but for real – this chick has mesmerizing prints down pat. You may have seen a few of her bright bikinis featured on here before, or perhaps one of her super cute coverups? She has completely nailed the beachwear look and other gorgeous summer styles, but I guess I’ve never seen what she’s done for fall/winter before. Perhaps I too have been living under a rock! Just like in her spring/summer collections, her fall show features eye-catching prints in a bevy of fresh and fun color schemes. She plays with a ton of fun fabrics and textures, and every silhouette is unique from one to the next. If you love a good statement coat, look no further. So. Many. Good. Coats. Since spring (and hopefully beach trips aplenty) are right around the corner, be sure to shop her current collection. A few knockout items include this turquoise printed maillot, this parrot-embroidered LWD, and this bright + sporty racerback bikini! Kate Spade is always a fun presentation to attend – there’s always so much color, so many fun details and accessories, and always a few perfectly-perfect party dresses! My favorite look from the collection is this dainty pink frock, complete with an oversized bow in the back and a cheeky clutch! You’ll also find some elevated workwear (like the navy + white look above), casual weekend looks and several gorgeous faux fur pieces to take you all the way through winter. 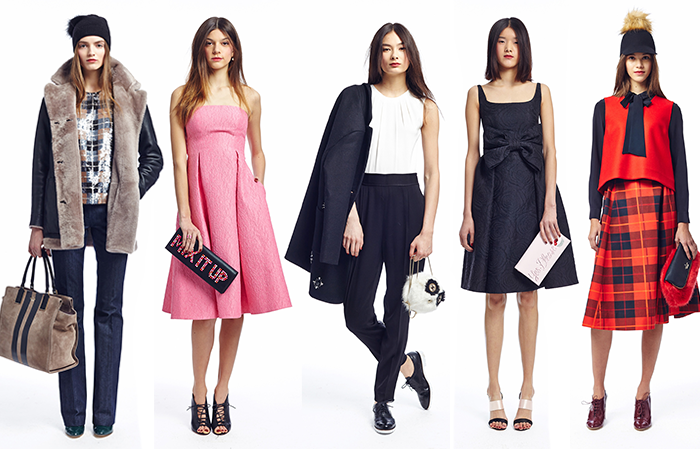 Be sure to shop the current collection at KateSpade.com! Stay tuned for another recap for the second half of fashion week next weekend!